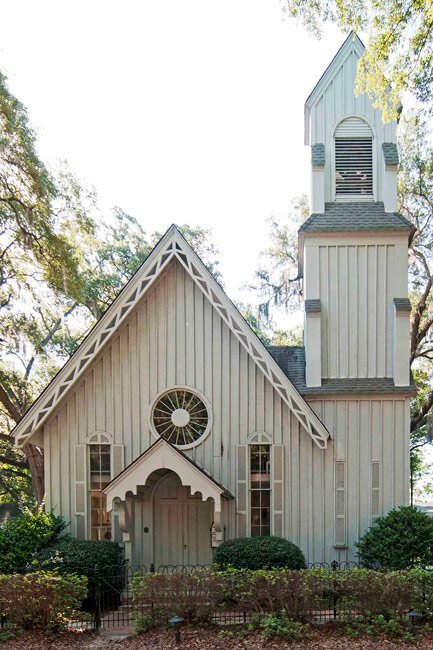 This Carpenter Gothic church in the Ridgeland community of Grahamville was built in 1858. However, the congregation itself dates to 1824, when Grahamville was developing as a summer retreat village for the planters of upper St. Luke’s Parish. 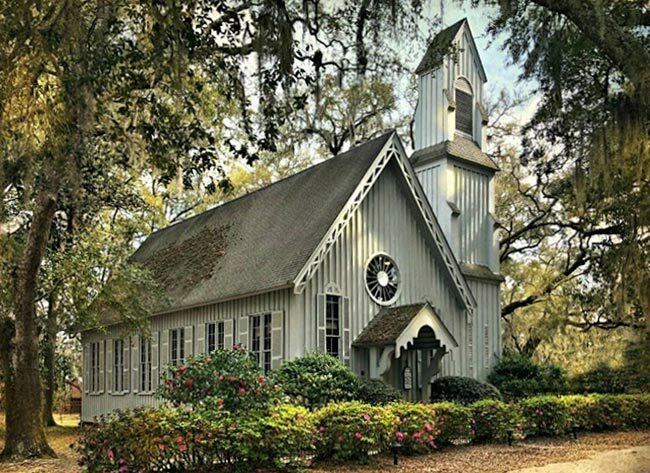 The congregation’s first sanctuary was called Union Chapel and served as a chapel of ease for planters wishing to remain in Grahamville during the warmer months rather than travel to the parish church, which was close to the Beaufort County line. The community of Grahamville grew, and the need for a new chapel arose not long after Union Church was built. A second, larger sanctuary – called the Chapel of the Holy Trinity – replaced Union Chapel in 1830. Just a few years later, in 1834, the congregation became independent of its parish church. Now called the Church of the Holy Trinity, the second sanctuary was replaced by the present sanctuary in 1858. Member James Bolan, owner of Bolan Hall Plantation, provided most of the funds for the new building. 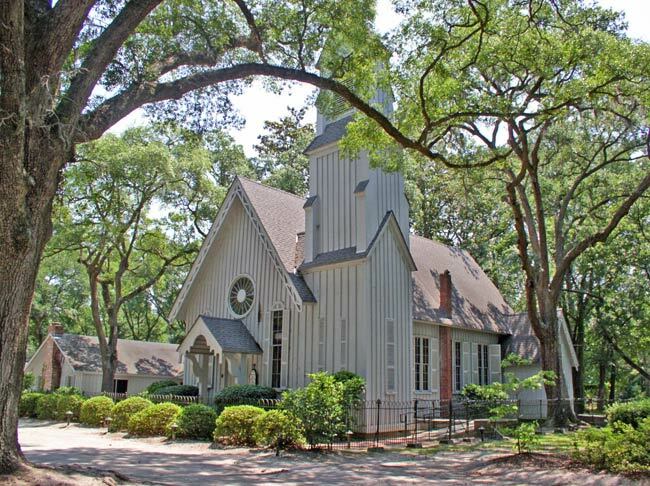 The live oaks gracing the grounds were planted sometime in the 1800s by the women of the church. The Reverend Arthur Wigfall, who served the church as rector in the 1850s, delivered a popular sermon in 1856 titled, “A Sermon Upon Duelling [sic].” The sermon was so well-received among the congregation that the Grahamville Association for the Suppression of Duelling [sic] was formed shortly thereafter. The group met biannually in this church once it was built. Most of the buildings in Ridgeland were burned by Sherman’s troops during the Civil War. The chapel, however, was spared since it served as Union headquarters. Its interior, unfortunately, was pillaged. The Church of the Holy Trinity, constructed ca. 1858, is the third building associated with an Episcopal congregation formed in the early years of the nineteenth century by Grahamville planters. The church is architecturally significant as a notable example of the Carpenter Gothic style. The style developed as a carpenter’s interpretations of the English Gothic Revival architecture of the early nineteenth century, with the masonry designs of the English architects translated into wooden construction. The proportions of the church, the asymmetrical composition, the wheel window, and the buttressed tower are exemplary of the Gothic Revival; the interpretation of these elements in wood, along with board and batten sheathing of the church, are typical of Carpenter Gothic. The three-staged bell tower has an exterior entrance to the stairway leading to the gallery, which was the old slave gallery and which now houses the pipe organ. The interior is especially noteworthy for its hammer-beam timber ceiling, and for its nineteenth century yellow pine furnishings. 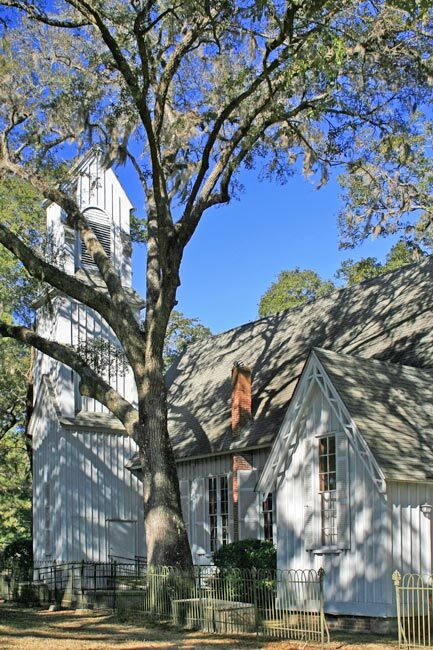 The church is set in a grove of large live oaks, which were set out in the nineteenth century by the ladies of the congregation. These trees add considerably to the visual appearance of the church.